Never dreamt to install a dreambox image just doing a simple Drag&Drop from your Windows desktop, and then just watching your PC screen until install is finished? Never asked: why to get in trouble with FTP, Telnet, and ugly shell commands when could be a program that could make all the stuff with an easy GUI interface? Never thought: "Every time Flash Erase!! Don't could be possible to do it automatically??" You also think that managing multiboot images is not easy and not confortable with the remote control? If you answered "yes" to these questions, here is the solution: FlashWizard ! FlashWizard PRO is a powerful firmware installer for Dreambox DM7000 - DM 500 - DM 56x0, with channels, bouquets, settings and timerlist copy and restore options. 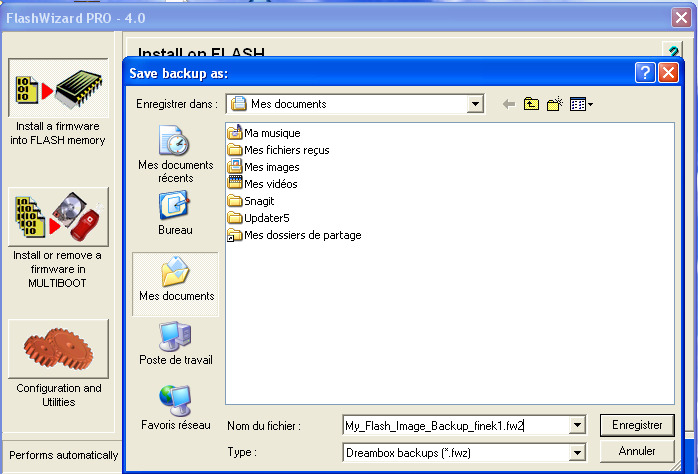 FlashWizard allows to install Dreambox images directly from Windows desktop via drag and drop, performing automatically all the needed procedures (including reboot and flash erase). No more buttons to press on Dreambox panel! Images can be installed in Flash memory or Multiboot, on Hard Disk and/or Usb Stick, even together: they will be automatically recognized at boot-up time. 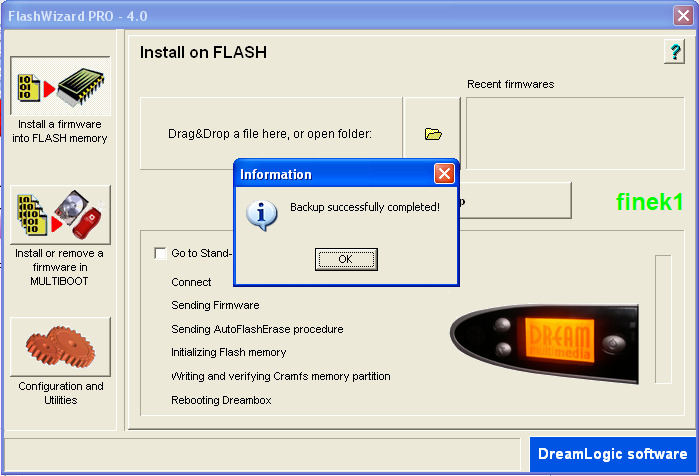 FlashWizard allows also to make complete Backups of the installed images, both for flash memory and multiboot, that can be restored at anytime, even on other dreamboxes than yours. FlashWizard PRO has his own boot menu in 256 colors, that allows to display the boot logo (the starting picture) also for the images nstalled in multiboot on Usb Stick or Hard Disk or NFS mount. And, more, the VCR Scart output is enabled by FlashWizard PRO boot menu, even at boot time.